This video was making the viral rounds over the weekend. I think it gives a better understanding about the energy waiting to be tapped from the wind. What do you think? The June 29, 2012 derecho swept across from US from west of Chicago to the East Coast, leaving as many as 5 million households without power. The storm traveled at speeds of over 60 mph, with wind gusts approaching 80 mph. At least 22 people were killed. A derecho (pronounced deh-RAY-cho, a Spanish word meaning “straight ahead”) is an hours-long windstorm associated with a line of severe thunderstorms. It is a result of straight-line winds, not the rotary winds of a tornado—hence its name. Derechos in the United States are most common in the late spring and summer (May through August). The extreme winds of a derecho—up to 150 mph in the strongest storms—come about in the following way. Derechos are often associated with a quasi-stationary front in mid-summer. If the atmosphere just north of the front is very unstable, the front may trigger rapidly developing thunderstorms. A line of thunderstorms that forms in the vicinity of the stationary front can, via its cold downdrafts, drag down high-speed air from above. This can cause the high winds of a derecho. At the same time, the high winds push the line of thunderstorms outward, causing it to bend or “bow.” This results in a bow echo image on weather radar. Once they get going, derechos can cover lots of territory—up to 1000 miles—and leave significant property damage in their wake, even flattening entire forests. In some cases, derechos wreak as much havoc as a hurricane or tornado. About 40% of all thunderstorm-related injuries and deaths occur because of derechos. 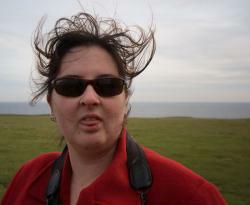 As the cold wind blowsCourtesy Erik OganIf you're in the upper midwest or in the Minnesota neck of the woods your hair probably looks awesome today. We're experiencing an epic storm system due to a record low pressure system sitting over the northern part of the state. 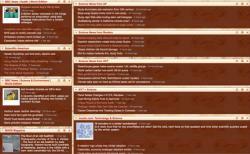 Unsurprisingly, MPR's updraft blog has some good material on the amazing Land Hurricane of 2010. The record low pressure map there is pretty cool. I saw several downed big tree limbs on my way into work this morning. I wonder how city public works departments respond to mega wind storms like this. I'm reading a great book all about various parts of urban infrastructure, and it leads me to think that there are lots of guys in cherry picker trucks driving around the city dealing with downed power lines today. Naval architects believe that huge 5 megawatt wind generators could be mounted on three floating legs, much like a deepwater oil production platform. Their paper titled WindFloat: A floating foundation for offshore wind turbinesis in the Journal of Renewable and Sustainable Energy. More info and a podcast can be found via Scientific American. LEEDCo is leading efforts to build, install, and deploy an offshore wind farm on Lake Erie. An initial five wind generators (20-megawatts, enough to power 16,000 homes) are to be located near Cleveland, Ohio, with a 2012 completion target. The expected cost is projected to be $100 million. LEEDCo recently announced a long-term partnership with GE who will provide the 5 direct-drive wind turbines for LEEDCo’s 20-megawatt offshore wind project. Approval from at least 16 federal and state agencies, including the U.S. Army Corp of Engineers, the Ohio Department of Natural Resources and the Public Utilities Commission of Ohio. LEEDCo has yet to file any permit applications but does meet weekly with an interagency task force, the Lake Erie Offshore Wind Team, that Strickland created 18 months ago. Concerns that the turbines will harm birds and bats. A $350,000 study is under way, including radar, laser and acoustic identification of bird and bat flight paths. The proposed site will need a four-mile radius of air space in which few if any birds have been detected. How to anchor the towers in Lake Erie. Engineers must determine whether to sink steel piles down to bedrock, typically some 60 to 80 feet below the "glacial till" on the lake bottom. If pilings are needed, officials are uncertain whether the region still has the capacity to produce enough of the heavy steel that would be required. A way to get the power to shore. Underwater cables from the turbines to shore would need right-of-way approval from the state. The impact of winter ice. Plans call for an ice cream-cone shaped foundation at the water's level, which forces the ice down and breaks it, hopefully saving on cost, LEEDCo's Wagner said. A means of paying for the project. Financing details are still tenuous -- and could be more complicated than the engineering, said Wagner. The Global Wind Energy Council said that China doubled power capacity from 12 gigawatts to 25 gigawatts last year. The wind power sector grew rapidly last year. It was up 31% despite the economic downturn. 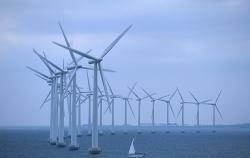 The market for new wind turbines was worth $63 billion in 2009. China is aiming to increase that sixfold — to 150 gigawatts — by 2020. The Chinese Renewable Energy Industries Association says it could hit that target far earlier. But wind power still accounts for only 1% of China's total electricity consumption. The United States overtook Germany as the biggest producer of wind power last year, new figures showed, and will likely take the lead in solar power this year, analysts said on Monday. Wind accounted for 42% of all new electricity generation installed last year in the U.S. The wind industry now employs more people than coal mining in the United States. (click links in red to learn more). "Stanford creates 100 million dollar energy research center"
"Stanford University is creating a 100-million-dollar research institute that will focus on energy issues, including the search for ways to reduce global warming, officials said." "Home turbines fail to deliver as promised, warns British study"
"Home wind turbines are only generating a fraction of electricity promised by the manufacturers while some even fail to yield enough energy to run the turbine's electronics, a British study warned on Tuesday." "'V-wing' turbine gets study cash"
"An unusual design of wind turbine with a pair of giant vertical wings could one day be generating electricity for the UK Grid." "China's BYD to bring plug-in hybrid, electric cars to US in 2011"
"China's BYD Auto announced plans Monday to enter the US market in 2011 with a range of electric and plug-in hybrid vehicles. It would likely be the first Chinese automaker to enter the highly-competitive US market and beat many established automakers in offering an extended-range electric vehicle to US consumers." "A bicycle evangelist with the wind now at his back"
"For years, Earl Blumenauer has been on a mission, and now his work is paying off. He can tell by the way some things are deteriorating around here." 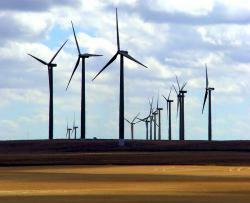 Wind powers up jobs in Faribault, MN. In Newton, Iowa, TPI Composites opened a wind turbine blade manufacturing facility that hopes to provide 500 jobs. The Faribault factory hopes to add 30 jobs per year to total 200. 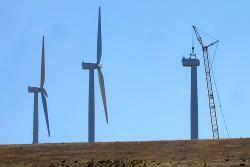 Click here to read about more wind energy jobs created. The American Wind Energy Association was relieved by the passage of the Economic Stabilization Act. These tax credits are essential to the continued growth of wind energy, to the economic and energy security of the United States, and to a successful beginning in the fight against global warming. The Solar Energy Industries Association (SEIA) also was happy to see the legislation extend the 30-percent federal investment tax credit for both residential and commercial solar installations for 8 years.